If it’s time for a new torch, learn the basics of bulbs, beams, batteries, and more before heading to the store. Then, read on for our top picks to get the right light to suit your needs. Battery-operated, hand-held flashlights have been around since 1898 and have come a long way since. These household must-haves—crucial in power outages, helpful for late-night security checks, and valuable when trying to find something under the bed—are not only brighter and more dependable than ever, they’ve also become more compact and lightweight. 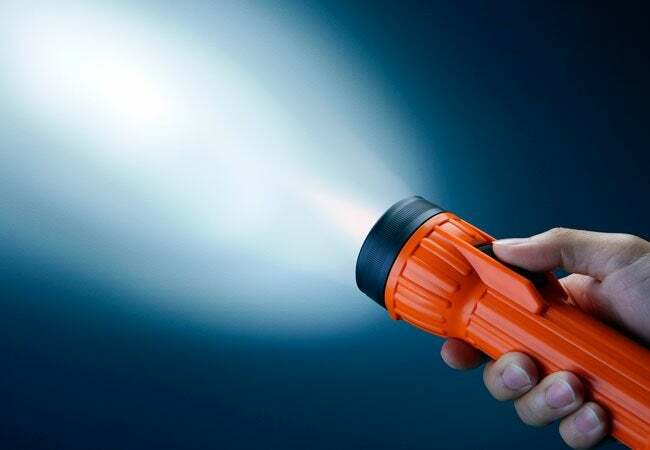 So whether you need a beacon for your bedside table, glove compartment, utility drawer, or emergency kit, here’s all the info you need to find the best flashlight at the best price. The American National Standards Institute (ANSI) rates flashlights by their light output, battery runtime, beam distance, and beam intensity. When browsing the flashlight aisle at your hardware store, you’ll notice that every package bears a series of ratings. Understanding what these ratings mean is key to locating the best flashlight to meet your needs. Light Output. You can still find a few flashlights with incandescent, krypton-type bulbs, but the vast majority of today’s models feature LED (light-emitting diode) bulbs that produce brighter beams over greater distances. The amount of light a flashlight produces is measured in “lumens.” A flashlight producing 25 lumens is sufficient for reading a book under the covers, while 200 lumens will illuminate the corners of an average size yard. Need more? Flashlights with over 1,000 lumens are available; just don’t aim them toward your neighbor’s windows at night! Beam Distance and Type. Flashlight packages tell how far the beam will go and what sort of beam it is—both important considerations. The distance a beam will shine is given in meters. For instance, a beam distance of 200 meters is equal to just over 650 feet. There are also two types of beams. A “flood” beam lights up a wide area, while a “spot” beam produces a narrower stream of light that travels a greater distance. Some flashlights allow you to toggle between a flood beam and a spot beam as needed. Battery Runtime. With more intense and powerful light output comes the need for longer battery runtimes—after all, a high-lumen flashlight won’t do you much good on a weekend camping trip if the batteries run out in two hours. The more powerful the beam, the more quickly the batteries will drain. Fortunately, many flashlights today use rechargeable batteries. They cost a bit more than disposables but will save money over time if you use the flashlight frequently. Waterproof Ratings. The abbreviation “IPX” (for Ingress Protection) denotes that a flashlight will resist moisture and water, something to check for if you plan to take your torch on adventures where it might get wet. • A rating of IPX-4 means the flashlight should be okay if gets splashed by a little water. 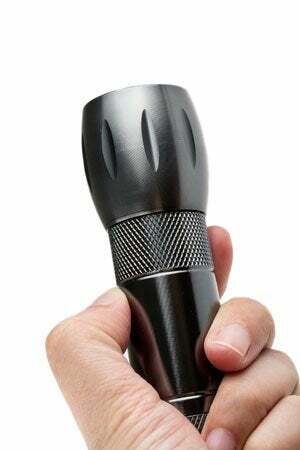 • A rating of IPX-7 indicates the flashlight should survive being submerged for up to half an hour. • A rating of IPX-8 indicates that the flashlight will still be operable after being submerged for up to four hours. Ranking among Wired.com’s top choices for compact flashlights, the Streamlight ProTac HL packs a ton of features into a pocket-sized powerhouse. Made of impact-resistant anodized aircraft aluminum, it weighs less than 6 ounces, measures only 5.4 inches in length, and comes with a canvas holster. Its adjustable light output lets you crank beam intensity all the way up to 600 lumens or tone it down to a discrete 33 lumens. The ProTac features a no-fumble, push-button end-switch for easy on-and-off operating. At full beam intensity, the ProTac operates for approximately 1.5 hours before needing to recharge its lithium batteries; at its lowest output, batteries will last up to 18 hours. 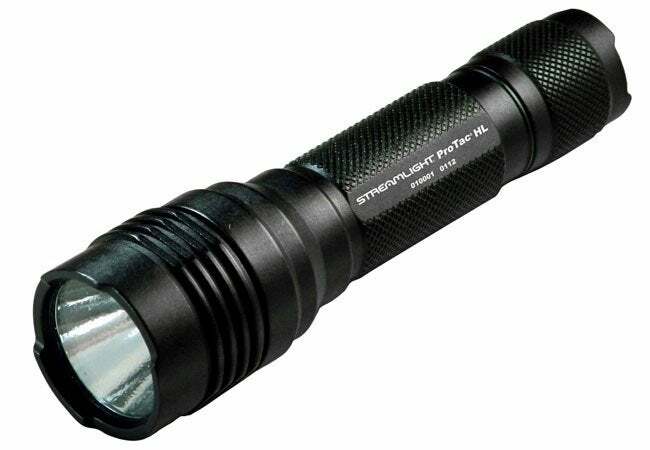 Satisfied buyers on Amazon.com give the Streamlight ProTac 4.5 stars for its super-bright light and small size, making it a great flashlight for evening walks. Available on Amazon. 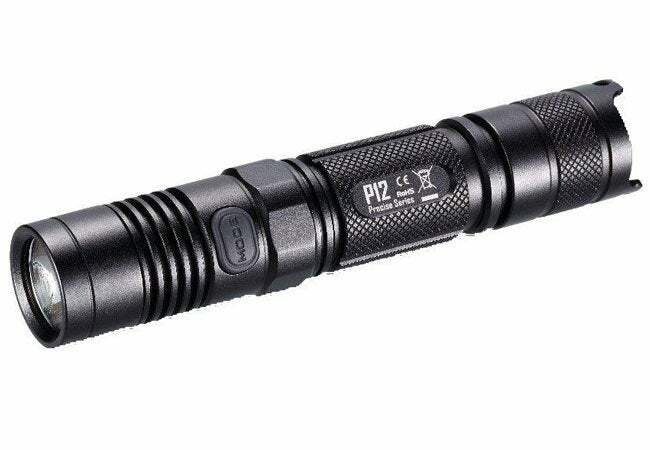 Patterned after military and law enforcement gear, the NITECORE P12 1000-Lumen Waterproof Tactical Flashlight wins top honors from Outdoors Magazine for its powerful beam that illuminates up to 232 meters. It comes with an IPX-8 waterproof rating and a tough, military-grade body. Its side-oriented power switch doubles as a battery life indicator. At maximum intensity, the NITECORP’s rechargeable batteries last approximately 1.5 hours; reduce the beam to 70 lumens and battery runtime can last up to 28 hours. Among its best features is the ability to strobe an S.O.S. signal in emergency situations, and an included car-charger for recharging on the go, earning the NITECORP an impressive 4.3 Stars from Amazon buyers. Available on Amazon. 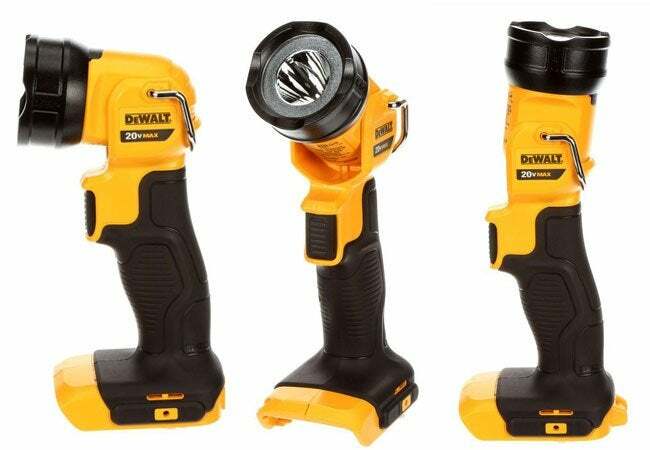 From a manufacturer well-known to DIYers, the DEWALT 20-Volt Max Lithium-Ion LED Flashlight earns a 4.7 star ranking by Home Depot buyers. This quality multipurpose flashlight weighs in at 9 ounces and measures 7.5 inches long, with a comfortable pistol-grip, and its 110 lumens is ideal for illuminating your yard at night. Yet perhaps its best feature—making it the perfect flashlight to stow in a toolbox—is a 120-degree pivoting head and stand-up base that let you direct the light where you need it (such as at under-sink plumbing) while leaving both hands free to work. A 20-volt max 3.0 Ah lithium-ion battery and charger, both sold separately at $99 each, are required—but if you own other battery-operated DEWALT tools, the batteries are interchangeable, so you’ll have nothing else to buy. Available at The Home Depot.